I have mentioned on my recent post that Ren and I have survived Grade 1. We were surprised that Ren brought home (okay I need to emphasize on this) S.E.V.E.N (7) awards on their recognition day. I’m happy with what he got because his school did not only focused on the academic achievements of the kids but they also recognized the kids other capabilities and intelligence as well. I am one of the believers of Multiple Intelligence. I know that to be able to succeed in life, one should not be brain smart alone. Parents like me need to learn progressive approach to be able to help our kids be a multi-achiever. Instead of having one intelligence, it is claimed that we have several different intelligences. Ren is already a Visual and Linguistic Smart. I was surprised when he was recognized to be excellent in Math this year, which means he is learning to be a Number Smart also. I let him do swimming and football to help him be a Body smart. I also exposed him in playing the lyre and piano for him to learn to love music and be Music Smart. We try to go to various places and discover the world for him to appreciate the wonders of nature and be Nature Smart. To be a Myself Smart, he is now keeping a diary to know himself. People Smart is in progress, he is attending social group classes to enhance this skill. Let us learn to let go and expose our kids to various activities. Do not limit their capacities on the things they know already. If you are a #MultipleIntelligence believer like me, then join this contest in partnership with Progress Pre-School GOLD. This contest will start today April 14 and will last until April 20. Winners will be announced on April 24, 2015. 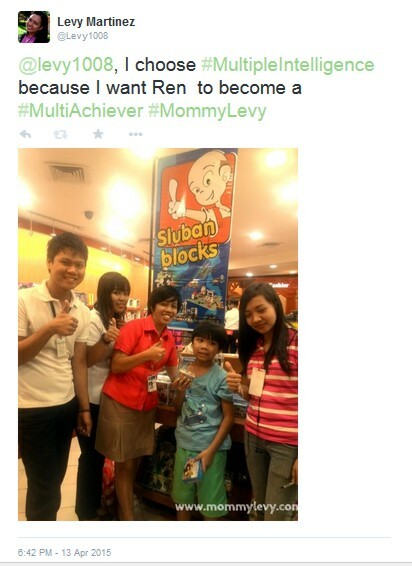 Remember to include the hashtags #MultipleIntelligence, #MultiAchiever and #MommyLevy to qualify. This is open for parents residing in the Philippines with kids 4 to 7 years old only. If the picture shows a child/children in it, they must be at least 4 years old. Entries with photos of children below 4 years old will be disqualified. In addition, photos must not include pregnant women. Congrats Kuya Ren! Ang daming awards 🙂 . Hope to see you soon and set the play date with Jelvin.